The stunning Sports Illustrated model Kate Upton debuted her massive engagement ring on the red cepet at the 2016 Met Gala. Upton will soon walk down the aisle with Detroit Tigers pitcher Justin Verlander, whom she's been dating on-off for nearly three years now. Jeweler Anita Ko, who worked with Verlander to create the sparkler, created a unique twist on the popular single solitaire, setting the (enormous) center stone inside delicate “swags” of pavé diamonds and setting it all on a diamond-studded platinum band. 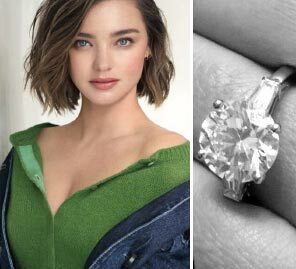 “Justin and I collaborated on creating the most perfect one-of-a-kind ring that is rare and of exceptional quality, just like their love,” Ko told People Magazine.